We are a group of academics who provide customized educational programs around genomic and precision medicine to health care providers, academic institutions, industry, and other stakeholders. Our online courses are crafted to meet the needs of busy professionals who want to learn the basics of precision medicine or gain practical skills for implementing precision medicine into practice. These courses are offered several times a year - join our mailing list to be notified when our next courses are open for enrollment. 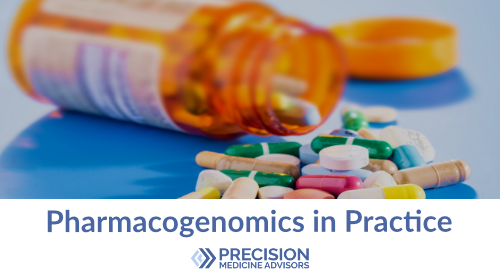 Learn how to to use genetic testing to optimize drug dose or reduce side effects and improve efficacy of prescription medications. This course is available for a limited time, enrolling through April 2019. Learn how to use genetic testing to identify persons with hereditary cancer risk, to prevent and manage disease. Want to be notified when this course opens for enrollment? Join our mailing list below. All you need to get started with precision medicine, in under 2 hours. Improve your genomic literacy and explore the breadth of applications of genomics in the clinic today. This online series is suitable for a lay audience with little to no background in genomics. Our workshops and live events are hands-on and interactive and closely track the rapidly evolving field of genomic and precision medicine. We have several hands-on workshops scheduled for 2019. Sign up for your spot in them now. You set the topics, location, and date. We bring the content and speakers. It’s that easy! Pharmacogenomic testing can help reduce severe adverse events and improve efficacy of prescription drugs. More and more genetic tests are being marketed directly to consumers. Explore the DTC genetic testing landscape. Understand how hereditary cancer genetic testing offers an opportunity for prevention and tailored treatments. Championing Precision Medicine Education for the Masses – Meet the Genome Educator. This podcast hits on the importance of educating everyone involved in precision medicine—including healthcare providers, payers, and even patients—about its day-to-day applications. Will FDA Regulation of Pharmacogenomic Tests Really Make Them Safer? This month, the US Food and Drug Administration (FDA) sent genetic testing company Inova Genomics a warning letter because they were selling a suite of pharmacogenomic (PGx) testing products, marketed under the name MediMap, without obtaining prior FDA authorization to do so. Patients with breast cancer as well as healthy at-risk individuals can benefit from genetic testing to determine whether their cancer is due to an inherited pathogenic variant in a cancer-causing gene. But the results of those tests are not always clear cut. The genetic basis of common diseases like diabetes, cancer, heart disease, asthma and Alzheimer’s disease is complex. The genetic underpinning of most cases of common diseases is not monogenic, but rather, polygenic. In other words, there are genetic variants of dozens of different genes, each with a tiny effect on disease risk. Want to stay current in genomic and precision medicine? Sign up to be notified when an online course opens, new content is posted to the website, or an in-person workshop is approaching.